MANILA, Philippines – Mercy David, a 25-year-old from Concepcion, Tarlac, and part of a generation of Filipinos born after EDSA, cannot relate to stories on the 14 years of martial rule under President Ferdinand E. Marcos, because there is no concerted effort to make them learn and remember. Mercy never learned it in school, but instead learned from her father, Carmelito Lobo David. The elder David was shot in the stomach and tortured as he was suspected as a cadre of the New People’s Army (NPA) during the Marcos regime. Mercy is one of the 13,000 who have filed claims under Republic Act 10368, the law passed by Congress that recognizes the heroism and sacrifices of all Filipinos who were victims of human rights violations under the Marcos regime. She is filing a claim in behalf of her father. Those eligible for compensation are the victims of summary executions, torture, enforced or involuntary disappearances, and other gross human rights violations committed during the Marcos dictatorship, covering the period from 21 September 1972 to 25 February 1986. Every morning since May 12, at least a hundred claimants from all over the country have lined up to file their claims. Some are from Isabela, Quezon, Bataan, Antique, Tarlac, Samar, and many other provinces. All of them are hoping that the Human Rights Claims Board will rule in favor of their claims for compensation. 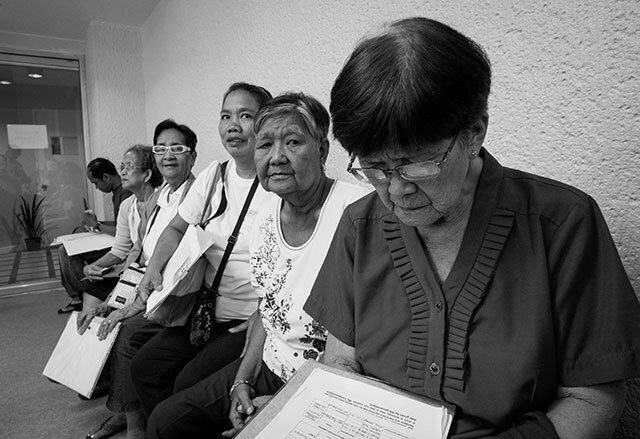 Some preferred to file their claims in Manila rather in their home province because they are afraid that their claims may not be filed. According to claimants from Basey and Marabut, Eastern Samar, a certain Rene from Tacloban allegedly offered to help them file their claims, for a fee of P850 per person. After collecting the hard-earned savings of the claimants, most of whom were also victims of 2013’s Typhoon Yolanda (Haiyan), Rene never showed up do what he had been paid for. The fiiling of claims ends on November 10, and everybody hopes that they will get approval of claim compensation. Many say they would like to make sure that the atrocities they suffered during martial rule under Marcos would not be forgotten.